Well, that's it, my baby is no longer a "newborn" anymore, but officially an infant! I can't believe it! She has grown so much and changes so much week to week. It's pretty hard to believe that 12 weeks ago almost to the hour, I was doing the last of my laboring and considering it to be time for a csection. I remember by that time I was beyond exhausted, beyond frustrated, and so ready to meet her! This last month has been a pretty great one. I got to celebrate my first Mother's Day which was really awesome. I got a necklace with Georgia's birthstone and the letter "G", my parents made me a picture with her hand prints, and I was able to enjoy a couple yummy mimosas and visit with friends and family. The weather finally turned really warm and beautiful Mother's Day weekend which we have really been looking forward to. Within the last month the biggest change for mama has been returning to work, I'm in my 3rd week back this week. 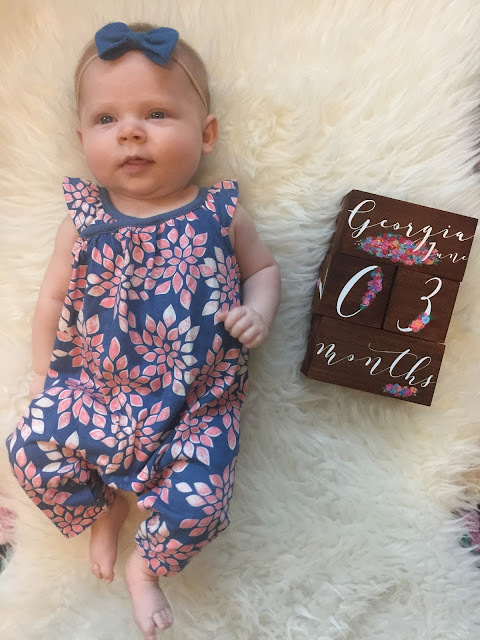 Georgia started with daycare 2 days a week on Monday in addition to being with my parents the other 3 days. So far she's doing so well (she's only gone to day care 1 day so far as of today!) and we got a really great report from her sitter. I know being at daycare will be so good for her when she gets a little older. She will make some great girlfriends there for sure! We don't see the doctor this month so I don't have exact stats but I'm willing to bet she's about 12+ pounds. This girl LOVES to eat and is still nursing so well. On the days that my parents watch her my mom brings her to me at lunch time so I can nurse her and see her. It's a great way to break up my work day. She always has big smiles for me! I am also pumping 2-3x a day which is a lot of work but also going great. Georgia is happiest in the morning, she loves to have her diaper changed and be nakey. She also loves her baths and her daddy. She smiles and coos so much now and I love listening to her make noises. She is constantly moving and kicking her little legs. Her feet are still too narrow for shoes so we just go barefoot all of the time especially now that the weather is warm and we don't need socks! She rocks at tummy time and loves to lay on her play mat and her Boppy lounger. She also loves being wrapped/carried. We recently got the Lillebaby carrier for daddy and she falls right to sleep in that. We go on lots of errands and outings and she's always very well behaved. I'm looking forward to taking her on a day trip to Galena for Memorial Day weekend! She's starting to get the hang of sucking on the paci without help, but that is still a work in progress. Three months certainly has gone by fast! We have so much going on this summer and I can't wait to watch her grow and enjoy everything that we have planned. Our next big adventure after Galena is mommy's birthday June 8th and a wedding weekend extravaganza, Georgia's Aunt Delaney is getting married on June 9th and some friends of ours are getting married June 10th so that should be a fun filled weekend. We are also looking forward to Father's Day and daddy's birthday which is also in June. We're enjoying every second that we have with our girl, she's such a sweet baby and watching her grow has been so amazing! What a cutie pie!! Wow 3 months already? Unbelievable! Gosh! 12 weeks already! She is such a peach, I can't stand it! Happy belated Mother's Day! Your FIRST Mother's Day!!! What a big an exciting milestone. So happy to see you at this end of your journey friend.